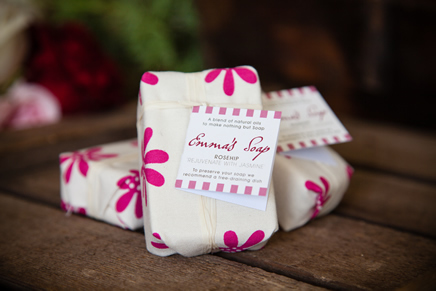 Emma's Soap: Handmade in Devon, fairtrade, palm oil free, no petroleum/mineral oil, no parabens. Rosehip soap is rich in vitamins & minerals inducing skins healing. Jasmine essential oil combination emotionally uplifting and stimulating of the mind whilst boosting confidence and immune system. Rosehip is used in hospitals in Italy as it has been shown to reduce scaring and induce skin healing. With its rejuvenating properties this oil is invaluable for sensitive skin. Used for wind chap, sun burn, fine lines and rosacea. Can be used on the face and body. Ingredients: Sodium olivate (Extra Virgin Olive oil), Aqua (Water), Sodium sweetalmondate (Sweet almond oil), Sodium cocoate (Organic Coconut oil),) Saponified Rosehip oil, Cera alba (Beeswax), Glycerine, * Jasminum grandiflorum (Jasmine), *Cinnamomun camphora (Howood), *citrus limonum (Lemon). Contains Linalool, Geraniol, Citronellol. Natural constituent of essential oils listed.